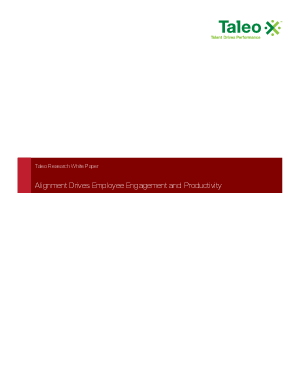 Alignment Drives Employee Engagement and Productivity: By a two to one margin, companies surveyed in a Taleo Research study reported the largest risk to their company's bottom line and brand is low employee engagement and productivity. Many drivers affect employee engagement and productivity. In fact it is hard to separate the two. Highly engaged employees are more productive, but, how do you keep employees engaged to maintain high levels of productivity?